Sometimes simple is best. This is what you can think when you're looking on the Music Man Axis or some Charvel guitars. The MM Axis is a two pickup guitar with a simple, 3-way toggle pickup switch and one pot – volume. This is completely enough if you want to get just clear, distinct signal – especially if your guitar is made from some high-grade wood and got some nice pickups. I used DiMarzio's pickup wire color code (like in the Axis). There is a SPDT (3-pin) 3-way toggle pickup selector. What this simple wiring means for your guitar tone? In comparison with some typical two or three-pot configurations, this one will cut off much less treble from the signal. It means a distinct, quite bright tone. It's great for screaming solos and crispy rhythm riffs. Eddie Van Helen and George Lynch really like this configuration of guitar electronics control. I also recommend it for those of you who don't use the tone pot a lot. 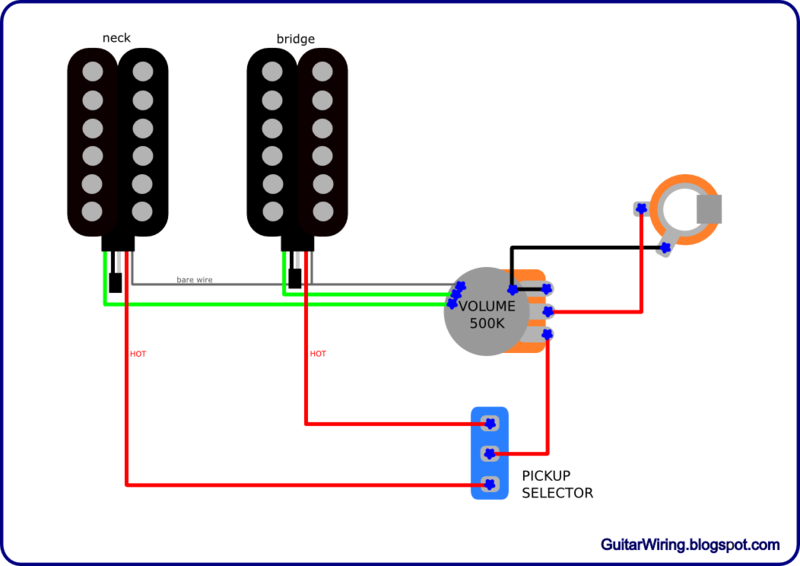 Maybe with this simple, single-pot wiring you will get more nice things from your guitar's wood and pickups.